From South African Blog, Disaster Africa 2nd August 06. 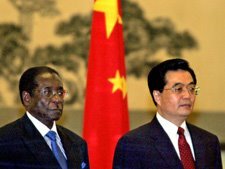 Zimbabwe's ruling party is to set up a political school to train cadres along the lines of China's communist party. it was reported on Wednesday. Elliot Manyika, Zanu-PF's national commissar, made the announcement following a lecture by visiting academics from the Communist Party of China (CPC), said the state-controlled Herald newspaper. Manyika said Zanu-PF would draw on the experiences from the CPC and the good bilateral relations between the two parties to set up the school, the newspaper reported. This is the first time there has been talk of a dedicated Zanu-PF party school, although President Robert Mugabe's government in 2001 launched a number of youth training camps he said were meant to teach young people patriotic values. The camps have been mired in controversy following allegations that graduates were used to intimidate members of the opposition party. Many of them are reported to have closed down because of lack of food and supplies. Manyika said students and academics had an important role to play in conducting research for Zanu-PF. The authorities in Zimbabwe are vocal in their admiration of China, specifically following China's recent drive to invest in projects in the Southern African country, particularly mining. Mugabe has encouraged businessmen and all Zimbabweans to look east for inspiration, instead of turning to former colonial power Britain and other Western powers who are critical of Zimbabwe's human rights record and land-reform programme.